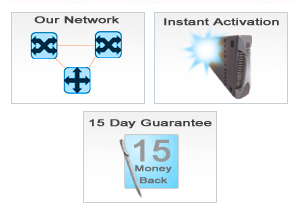 Throughout my experience with Servtex it has been a top of the line hosting service. There was no crashes on the servers or anything along those lines like the rest of the companies. On top of that the prices are low and affordable for everyone. I highly recommend Servtex for your web hosting needs. Take a look at our state-of-the-art datacenter and backbone providers before you purchase. We can guarantee we will meet your speed requirements. No waiting for your account to be setup. Your account will be created instantly after purchasing. You can start uploading your files right away. We have a 15 day money back guarantee. If you are not completely satisfied with our hosting, we will refund you, no questions asked. Give us a try, and see what you think! Are you looking for a place to start a new website? We just created a new package for you. It's only a dollar a month so you don't have to worry about paying for services you won't use. Also if you're looking for a low budget place to store a domain, this is another great option that lets you have email as well as basic web services. Due to the continued success of Servtex.Com we're proud to announce that we've merged with Hostbliss Hosting. This merger allows us to DOUBLE our email, DNS and storage capacity! Thank you to all of our customers that have been with us over these years. We hired more server techs to enhance the security of our server, making the server more stable and reliable for our hosting clients. We are proud to announce that we just launched our affiliate system. Earn 100% of each affiliate sale you make. Read more about our affiliate program here. We are now offering reseller accounts. If your interested in becoming a reseller, check out our plans here. Servtex added new staff to its support team. Providing excellent support is our #1 priority. We also modified our prices to provide you with Indexpensive web hosting with a reasonable amount of resources. 15 day money back guarantee! Instant account creation on domain and reseller hosting plans. Earn 100% commission for each referral! Fast web hosting guaranteed!